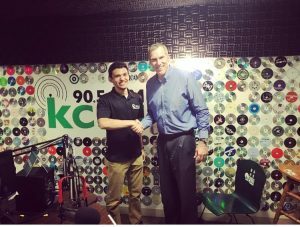 The Primary Elections are scheduled for June 23, and Doug Robinson, the business candidate, sat down for an interview at KCSU to promote his campaign for the Republican nomination for Governor. Robinson and I discussed some topics he is most passionate about like infrastructure, education, what media he consumes and immigration. Additionally, Robinson wants to prioritize infrastructure in our general fund budget. A huge component of Robinson’s vision for creating better infrastructure for Colorado is expanding the I-25 freeway to four lanes. The four-lane freeway would stretch all the way from Fort Collins to Colorado Springs. Instead of increasing taxes to get this plan done, Robinson suggests coming to the people with a 20-year bond at around $200 million dollars in annual debt to get this done. He suggests a solution of incentivizing high school kids to take American government and civics classes. “Give [DACA students], when they graduate, a high school diploma and citizenship to the US.” In Robinson’s system, high school students would take the United States citizenship test so that they can graduate an American. When asked about the media Robinson consumes he described that he listens to a lot of 9news, 4news, and CPR. While his print media consists of Wall Street Journal, Washington Post and the Denver Post. “I think that choice in almost all aspects of life is a better thing!” Robinson said jokingly when I asked him about giving families a choice in education. To ensure that each kid is given the same opportunity, Robinson says you must keep high standards and make goals measurable. Robinson believes in moving money into the classroom to pay teachers versus administrators to make jobs more competitive. To close our interview, I asked the candidate if he wanted to leave our listeners with a final message we hadn’t yet covered. To listen to our full interview, tune in for the re-airing at 90.5 KCSU on June 26 at 8 am or 12 pm.